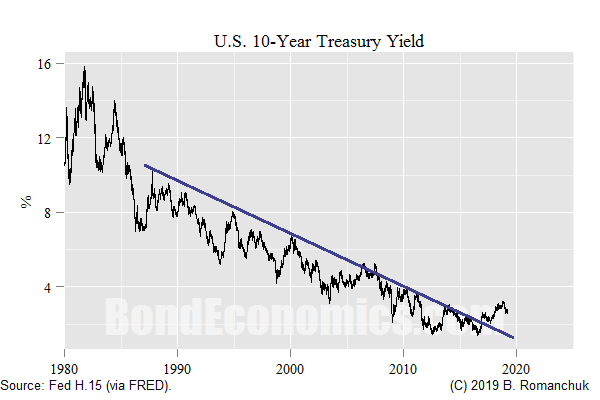 The yield curve inversion has once again raised the issue of what happens in the next recession. As was highly predictable, the mainstream consensus is now discussing the zero lower bound for interest rates. The chart above gives an excellent overview of what a "reaction function is": we do not worry about the current level of the policy rate, rather how the policy rate evolves in response to the evolution of the economy. As can be seen, the New Keynesian reaction function involves cutting the nominal rates to ever-lower levels as time passes. As basic mathematics suggests, the zero line will need to be crossed. The question then arises: what happens then? David Andolfatto wrote a recent article pointing out that the usual arbitrage argument that the zero bound is an economic constraint does not really hold. (The arbitrage argument is that entities can hold currency (dollar bills) that pay 0% interest rather than bonds.) Savers can pull cash out of the banking system, but the volume of $100 bills needed to drain even the current level of reserves is extremely large. Since we have observed mildly negative rates (around -1%), this is certainly correct. The question is: how negative can interest rates go? After all, 0% interest rates did diddly squat to stimulate activity in the past cycle; shifting that to -1% is not exactly going to move the needle. The fundamental problem with mainstream analysis is that the self-imposed constraint of deliberately obscure mathematics makes it difficult to model real-world institutions. The hope is that we get behaviour that be used to approximate real world data. Since parameter values can be adjusted to get a fit on historical data, this is reasonable enough. The problem is the extrapolation to institutional changes. Even though post-crisis DSGE* models can incorporate things like banking systems (which invalidates old critiques made by literary heterodox authors), the institutions are still bolted on top of a methodology that puts a household consumption function in the driver seat for the economic cycle. One ends up with stories about money acting like a "hot potato," and negative interest rates driving real activity. 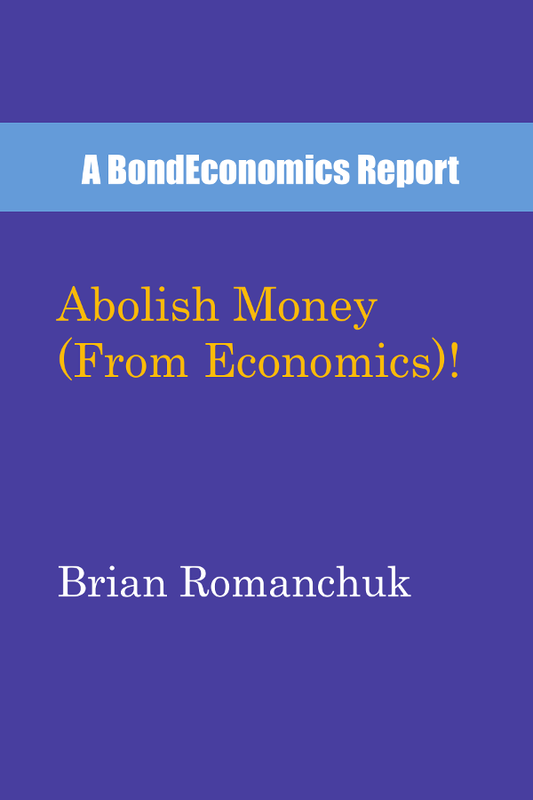 Loose thinking like that explains why I believe that "money" needs to be abolished from economic theory. If we look at working households, we need only look at the results of various personal finance surveys to know that the typical working household has financial asset holdings (outside of retirement accounts) of $500 or so. For most people, "money" already is a hot potato: the only saving they do (following the economic definition of saving) is via the forced saving of mortgage payments, and possibly via payments into retirement accounts. Negative interest rates will only affect entities with portfolios of assets, and so what we need to think about the effect on portfolios, and not assume that hot potato money will result in purchases of current goods and services. An interest rate of -1%, or even -2%, is probably not that big a deal. However, if the risk free curve was pushed to -5% at the short end, we should expect to see some behavioural changes. The first thing is that even if large institutions cannot hoard cash, this does not preclude that behaviour for smaller entities. We would certainly see an uptick in some current consumption: people will be buying mattresses with built-in cash storage, fire safes, shovels to bury hoards in back yards, etc. A large contingent of people will stockpile precious metals. Some entities could offer deposit-like securities backed by cash. Tokens and gift cards would become an asset class (as in pre-Confederation Canada), particularly if there is a move by the government to replace paper money. Tax planning strategies would flip. Strategies to bring income forward would become extremely valuable; for example, capital cost allowances not taken advantage of. Individuals with retirement plans similar to the Canadian RRSP/RRIF model would have an incentive to collapse the plans early (although there would be a need to avoid raising the average tax rate paid). There would be a massive incentive to collapse balance sheets: using vendor finance (with an implicit interest rate of zero) becomes extremely attractive. In other words, in the real economy, the hot potato would be dumped, and behaviour marginally changed (although governments may see a step up in tax payments as they are moved forward). (See the appendix for a qualification to that assessment.) The inevitable "innovations" to avoid negative interest rates would be a dead loss weight for social welfare. Who is stuck with the hot potato? Entities with portfolios. From a portfolio perspective, a negative interest rate is a wealth tax -- but a wealth tax that only hits fixed income. So the course of action is obvious: shrink your fixed income holdings. The fixed income holdings end up being held by the entities that are pushed into them. These are portfolios associated with funding pensions, and insurance companies. On the insurance side, the bulk of bonds are held by life insurance, partly because annuities are sold as an insurance product. However, property and casualty insurance are forced by regulators to have liquid portfolios so that they can meet claims. Reducing their fixed income portfolio income will force them to raise premiums. Although some central bankers might rejoice that measured inflation would rise, rising insurance premiums are just a reduction in the standard of living, and there would be no income rise to compensate (other than for insurance salesperson bonuses). The pain will felt by anyone attempting to get a fixed income in retirement. Pension funds would ultimately need to cut benefits or raise contributions. For those in defined contribution plans or saving in tax-advantaged vehicles, they would need to pay more for an annuity, or else roll the dice on risky income producing vehicles: junk bonds, preferred shares, dividend-paying equities, foreign currency bonds, (crypto-currencies, precious metals,...). The need to increase savings to meet a target income level is exactly the sort of behaviour that neoclassical theories do not model. Given the large relative size of the cohorts around the retirement age, it would not be a surprise to see a net negative effect on current consumption. From a political economy perspective, the left may be happy to get some form of a wealth tax. There is no doubt that the top wealth quantiles will be affected the most (courtesy of having the most wealth). However, the ultra-rich (in North America, anyway) did not get that way by clipping bond coupons; they had large holdings of equities. The valuation boost due to expanding equity/real estate multiples (plus the reality that reducing interest expenses raises profits) is going to counter-act the drop in interest income. After all, the secular drop in interest rates over the past decades has helped raise wealth inequality for precisely that reason. Finally, one may note that this makes Modern Monetary Theory look far more sensible to the average middle class voter that is anxious about their retirement portfolios. Locking the risk-free curve at 0% forever is much more attractive than being forced to check out the cat food cuisine options in the local grocery store** by New Keynesian central bankers. If a country pushed deeply negative interest rates for a long period, it would not be surprising for parallel currency usage to pop up. In border areas (like most of the heavily populated regions of Canada), retailers already deal with foreign currencies. Given the advances in electronic bookkeeping, it is not impossible to see foreign currency use becoming more widespread. Furthermore, we have a dedicated group of crypto-currency fans who are software developers. Legal tender laws things like employment laws may limit the spread of parallel currency use. However, given the flexibility of contract law, creating a large economic incentive to abandon the domestic currency could easily drive innovations in that direction. Since everybody but New Keynesians would think that a negative interest rate policy is just plain nuts, it is unclear how strong efforts would be to enforce legal tender laws in this instance. * The ability to add the banking system relies on the models effectively jettisoning the "general equilibrium" component of DSGE models. That is, they are really "DS" or even "D" models. ** I generally avoid endorsing products, but my cats really love the new Friskies(tm) salmon chunks with extra gravy. A steady income stream becomes more valuable if interest rates go down. Of course, a income stream with zero income has zero value no matter what the interest rate is. Now if an asset has a negative income stream (meaning that it loses money each year), it should have a negative value for the owner. Would this a salable asset? The answer may be 'yes'. An asset may have a predictable future value despite having negative current income. Any asset with a predictable future value may be considered as being a 'store of wealth', albeit a declining store of wealth. It could be sold with an appropriate discount.